Newsom said California must "be real" about high-speed rail in the state, and that there "simply isn't a path" to completing the full vision of the project, which would connect San Francisco and Los Angeles by bullet trains in less than 3 hours. At the same time, he affirmed the state's commitment to completing the 160-mile first phase, which will connect Bakersfield to Merced. Most media reports portrayed Newsom's announcement as a scaling back of the project. One actually said that Newsom had "ditched" it. The truth is both more complicated and much more hopeful. Here's the reality: The Central Valley segment is and always has been the foundation for the whole vision of high-speed rail in California. Getting 200+ mph trains up and running from Bakersfield to Merced—as soon as possible—is crucial. So the state's reaffirmed commitment to building that segment is big, and it's something we should celebrate. It means that a solid foundation for the whole system is guaranteed. That makes it more—not less—likely that entire San Francisco to Los Angeles line will be built. First, the Bakersfield to Merced line will demonstrate the viability of true high-speed rail for the first time in the U.S. context. The hardest part of translating a dream into concrete reality is often taking the first step. The Central Valley segment promises to be that step. Any uncertainty about its future has been erased. Narrowing the project's near-term scope will help the California High Speed Rail Authority focus single-mindedly on finishing the first step. We should also welcome Newsom's call for greater transparency and stricter oversight of the project going forward. More accountability will benefit not only the Central Valley line but future high-speed rail projects in California and across the U.S.
Second, having a segment up and running will create the long-term political will for extending the system's reach to San Francisco and Los Angeles. The catch 22 of this project has always been that getting the full system built depends on political will. Yet building political will depends on making the system usable before it's fully built out. Newsom's intervention shifts the focus to building near-term political will by making one segment usable for Californians as soon as possible. But he didn't kill or "ditch" the longer term, big-picture vision of the project. In fact, he did just the opposite. Newsom said that the necessary environmental reviews for building the full line will continue, just as planned, and that California will continue to seek private and federal funds to make it happen. With high-speed rail receiving new attention in Congress, and climate change moving rapidly to the center of political debates, it's not far-fetched to believe the project might receive federal funding in the near term. It is, after all, the only true high-speed rail project currently underway in the U.S. 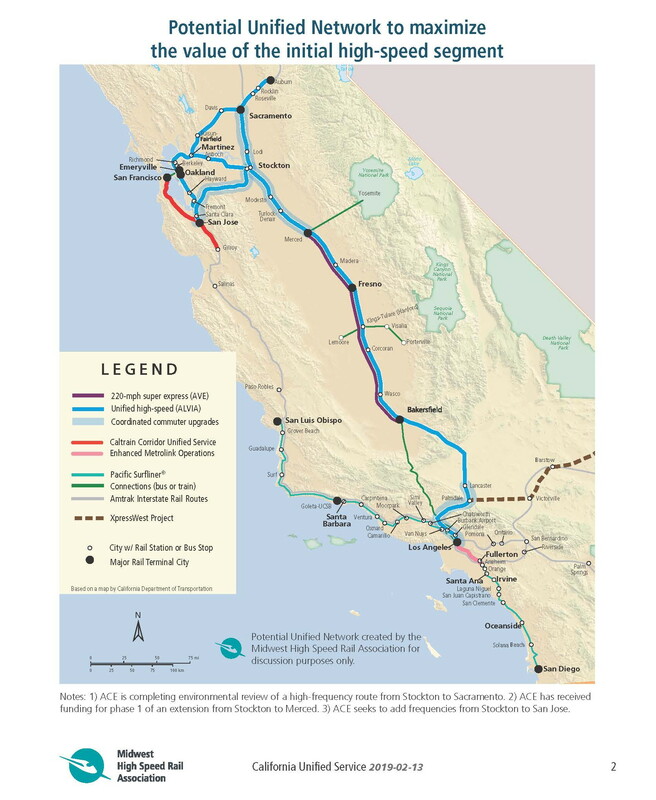 In the meantime, the first segment of high-speed rail can build popular support and political will by integrating transportation systems across much of Northern California, even without a high-speed line running all the way to San Francisco. Ongoing upgrades to Amtrak lines running from Merced to Sacramento and Oakland provide a great opportunity to create a unified network that includes local transit systems and passenger rail lines, with the Central Valley segment as the backbone. The Amtrak upgrades should include a dramatic expansion of daily round-trip runs to Sacramento and Oakland—to at least 16. The upgrades should also include new trainsets that can run at high speeds on high-speed tracks and run smoothly, too, at conventional speeds on freight track. In other words, California has a great opportunity to borrow from the European model, which seamlessly blends elements of high speed and conventional rail. The right train will need to switch quickly from electric to diesel operation, and its suspension will need to be flexible enough for freight tracks but stable enough for high speeds. The big-picture point is that this we should indeed be real about what's just happened in California. The governor hasn't ditched or derailed its high-speed rail project. He may have just given it a big boost. As always, the final outcome will depend on the amount—and the effectiveness—of pressure applied by advocates for high-speed rail. But the opportunities are as wide open and promising as ever. It's on us now to seize them. Tell President Trump to complete California High Speed Rail.